Les Misérables is the longest running show in the West End. Almost 30 years since it debuted at the Barbican, the show somehow manages to appear just as fresh, slick and cutting night after night. Viva La Revolution! 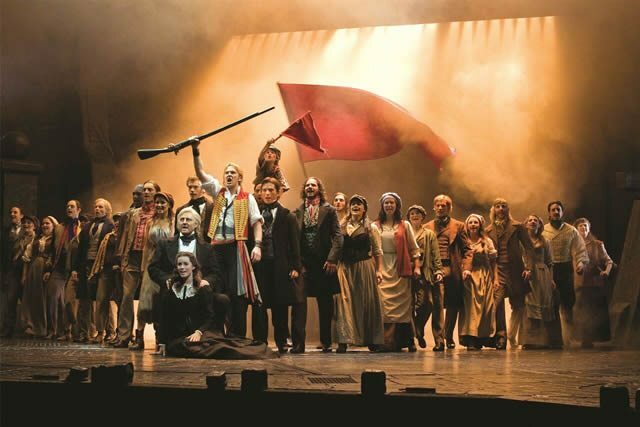 Alain Boubil and Claude-Michel Shonberg have produced several gems in their collaborative career (Martin Guerre, Miss Saigon ) but Les Misérables is undeniably the jewel in their crowns. The score is timeless and continually effecting; it is near impossible for any of the music to be sung with anything other than the utmost gusto! Costumes are bold but set is kept to a minimum, allowing focus to be shared with the score and the bodies on stage. The only really impressive piece of set is the barricade, which acts a visual symbol of struggle of revolution and the social and ideological barriers dividing France. Whilst the relatively sparse set is by and large a good thing, some small sections of the show do now look a touch outdated. Modern day theatre’s popular trend is that of the impressive set design (see The Curious Incident of The Dog In The Night Time for example) so when Javert disappears into a “whirlpool” of measly light projection, it is a touch underwhelming for such a crucial plot development. Celinde Schoenmaker and Carrie Hope Fletcher both sang beautifully as Fantine and Eponine, at times both bringing a tear to my eye. However the biggest surprise of all was Adam Linstead who, despite being on stage for just a few minutes as the kindly Bishop, absolutely owned the part in a seriously stand out way. Ultimately a musical is only as good as its music. By that logic, Les Misérables is the absolute best musical in town. 21 January 2015 - Viva La Revolution!